Rajmohan Krishnan is the Principal Founder of Entrust Family Office. In his two decades in the financial services industry, Raj has focused his expertise on managing wealth for a number of Exceptionally Wealthy families.Straddling a wide spectrum of financial and wealth related matters including Investment Advisory, Real Estate Advisory, Family Constitution, Charter, Business Succession, Estate Planning, and Investments towards Social Change, Raj is among the most experienced Family Officeadvisors in the country. Until 2012, he was the Executive Vice President of Kotak Wealth Management, heading North and South India Region. 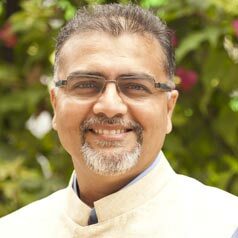 As part of the Leadership team, he has considerable expertise in developing and managing the growth of organisations He was the founding member of Kotak Private Banking business and part of the core team pioneering various business ideas. Rajmohan holds a Master's degree from the University of Madras and executive education certificate from Indian School of Business and IIM Ahmedabad. Rajmohan Krishnan, a.k.a Raj, is an avid golfer. He has a passion for photography, music and loves travelling.